If a park is there, but people can’t get to it, does it still exist? As cities grow in population and land for new parks becomes more difficult to find, we must refocus on the accessibility of our existing park system. If we have a great big park next to a neighbourhood, but a rail corridor, highway, or other barrier separates the two, then can we really say that park serves that community? There are two ways to add parkland to a city. One is to buy more land and build more parks. The other is to connect existing parks better to the people that could use them. Okay, so the second one doesn’t actually mean you’re adding land to the system, but making that existing land more accessible can have almost the same effect–especially if you’re connecting an underused park to people that want to use it. New York is building a pedestrian bridge to connect people over the West Side Highway to Riverside Park on the other side. Currently, the park is only accessible–if you can call it that–by going up and down a bunch of stairs and through a tunnel (which some residents noted feels unsafe). The new $24 million bridge is under construction right now and will make a more direct connection. Toronto has long had a proposal to create a connection over the rail corridor in the South Niagara neighbourhood just north of Fort York in order to link a growing community to larger park spaces and the waterfront to the south (I’ve written about this before). Originally, the plan called for a land bridge that would basically create new parkland over top of the rail corridor (see above image). 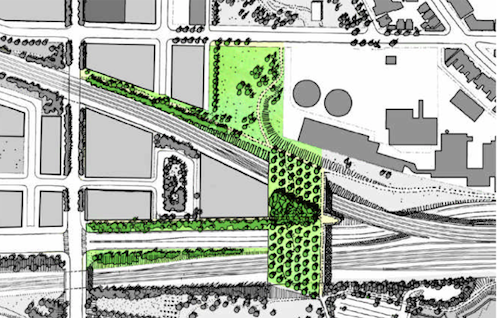 What’s now being proposed, however, is a pedestrian and cycling bridge that would connect new parkland being created just north of the rail corridor, with the already established large, green areas to the south. The title image to this post is one proposal for that bridge. Also in Toronto, the Green Line proposal would require pedestrian bridges to link up different parcels of hydro corridor parks over top of the underpasses that have been carved out to allow drivers to flow underneath a rail corridor directly to the south. (Full disclosure: I work for the charity advocating for this project.) Link up these parks with bridges and you have a 5 kilometre continuous linear park. Don’t build the bridges and you have still useful, but much smaller disconnected skinny parks. Creating good connections between parks can be like knocking down walls in a house. There is essentially the same amount of space as before but it feels larger and more immediate. It can also help parks increase their reach–a critical element for a growing city. A park that may have taken 25 minutes to get to by some hellish circuitous route, may now only take 5 minutes over a direct bridge crossing. The actual effect for people can be like adding new parkland. And, as we seen in the Fort York bridge example, these can become key elements of a cycling network. So yes, of course, as cities grow we should be looking at opportunities to increase the amount of parks we have by acquiring more land. No amount of connections between parks can account for parks in high-density areas that are over-crowded already. But I think sometimes we can get over-focused on the land acquisition issue as if it was the only solution to expanding the park system. Sometimes a better strategy is to look deeply at the parks you already have and make sure they are used well, connected to and serving the people they can. And if they’re not, then find a way to bridge that gap–sometimes literally.